The number of illegal entries into Europe by migrants hit a high point last year, and as their numbers increased, a picture emerged of the land and sea routes many migrants are taking to get there. In 2015, more than 1.8 million people crossed the European Union’s borders illegally, according to Frontex, the agency responsible for coordinating the security of the EU’s external land and sea borders. This was up substantially from 2014 (with about 280,000 detections of illegal border crossings) and 2013 (about 100,000 detections). In fact, 2015 saw the most illegal entries into the EU since Frontex began collecting data about a decade ago. Frontex’s data reflect apprehensions, or “detections,” of migrants entering the EU illegally (Frontex uses the term “irregular migrants”), so they are not an exact count of migrants entering Europe. Some migrants enter Europe illegally without being detected. Others are counted more than once because they cross European borders twice (for example, both a sea and land border) or try to enter the EU several times. Still others may enter legally on a travel visa, but overstay their allotted time in Europe or later claim asylum to remain, at least temporarily, in Europe. The Eastern Mediterranean sea route from Turkey to Greece (largely taken by Syrian, Afghan and Iraqi migrants) totaled nearly 900,000 detections in 2015, rising dramatically compared with previous years. But other sea routes have also grown popular with migrants, even though the relative scale is in the hundreds or thousands of migrants as opposed to the hundreds of thousands traversing the Eastern Mediterranean. The Western African route (a sea route from northwestern Africa to the Spanish Canary Islands) tripled in illegal detections between 2014 and 2015. The once-popular Central Mediterranean route leading to Malta or the Italian island of Lampedusa saw a decrease in the annual number of detected illegal entries between 2014 and 2015, but still saw at least 150,000 illegal border crossings each year. 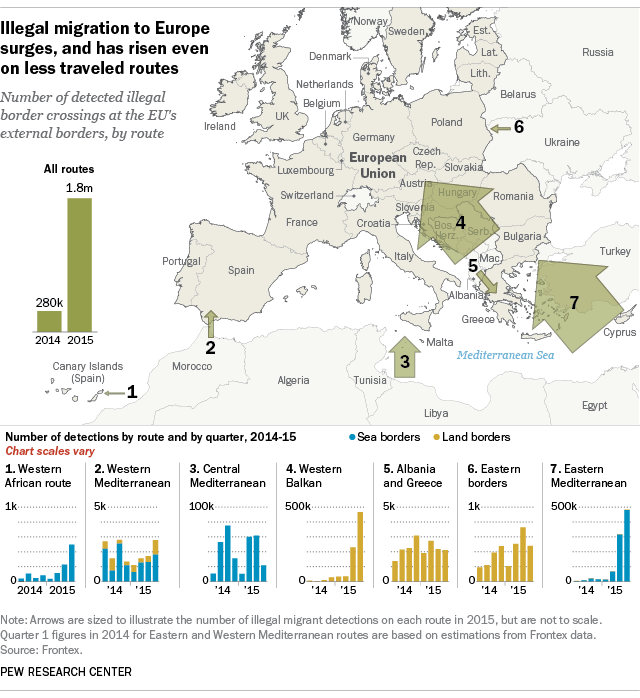 The Western Mediterranean route from Morocco to Spain also saw a decrease in illegal border crossings between 2014 and 2015, but saw a substantial increase in the final quarter of 2015 even as colder weather made sea travel more treacherous. Detections of illegal land crossings are up as well. Along the Western Mediterranean route, a greater number of migrants from Africa entered the Spanish cities of Ceuta and Melilla on the northern Moroccan coast illegally in 2015 compared with 2014. The 3,700-mile (6,000 km) Eastern land border also saw increased detections of illegal crossings between 2014 and 2015. In fact, some Syrians bicycled into Norway along the Arctic Circle. Sometimes land movement involves crossing the EU’s borders more than once. For example, the flow of Albanians from Albania to Greece and back again for seasonal work totaled roughly 9,000 in both 2014 and 2015. And in 2015, hundreds of thousands of migrants crossed into the Europe Union twice, once via sea from Turkey to Greece and again into Hungary and Croatia after passing through non-EU member states such as Macedonia and Serbia. The EU is currently negotiating with Turkey to stop the flow of migrants along its southeastern borders. If approved, some have predicted other routes may open or existing routes may become more popular as migrants in the Middle East, Africa and Asia continue to make attempts to enter Europe.